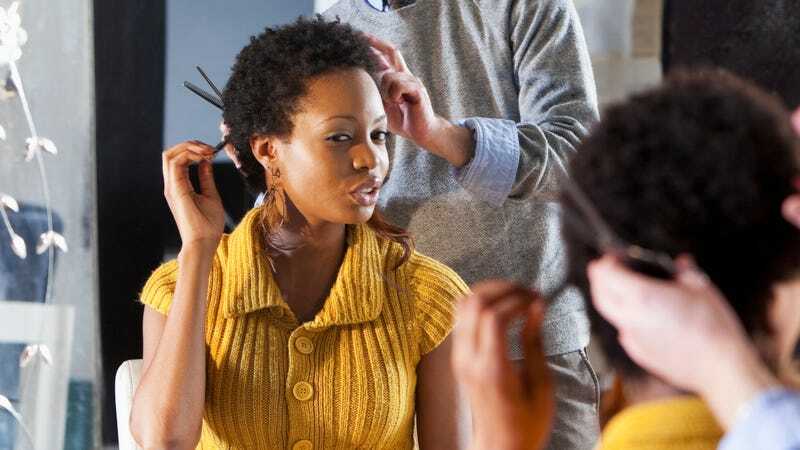 With the rise of the natural-hair movement, women choosing to wear their hair closely cropped and the growing variety of natural hairstyles, black women are beginning to consider the neighborhood barbershop a viable option. Along with the black church, the lady who sells “plates” out of her kitchen and the neighborhood Food and Drug Administration-unapproved pharmaceutical entreprenegro—commonly referred to as “the weed man”—the barbershop is one of the longest-standing staples in the black community. However, with women’s integration into these hallowed halls of haircut technicians comes great responsibility—namely, the acceptance of the statutes and traditions governing the barbershop universe. On behalf of The Glow Up, I decided to go over some of the most important tips, rituals and rules for those who are new to the world of black barbershops. Black Barbershops are easily recognizable. If the business has any of the following words in the name, it is a black barbershop: Cutz, Stylez, Nu, Kutz, Fresh, Dope, Fadez, Klip, Kingz, Stylez or You-Nique. You must be careful, however. The business must also have at least one person outside smoking a Newport (Black & Milds are also acceptable). I once burst through the doors of a place called “Kuttin’ It Close,” and the Caucasians inside looked at me like I was lost. I’m still reeling from that experience. One of the most important things to remember about the black barbershop is the code of conduct. Unlike beauty salons, haircutteries mostly operate on a first-come, first-served basis. More than any other institution, this is not a suggestion, this is the law. Skipping the line or allowing someone to go ahead of you is strictly forbidden. Furthermore, it is your responsibility to ascertain the order of service as soon as you arrive. The easiest way to achieve this goal is to ask the barber “How many you got?” as soon as you walk in. Here is the key: He is going to lie. Barbers don’t count the person whose head they are currently working on, the one immediately before you or the guy who just went next door to get a plate of wings. It is incumbent on you to do this mathematical calculation yourself. To determine how long your haircut will take, simply multiply the number of customers preceding you by the average number of minutes it takes your hair artist to do each haircut. Then add 2 minutes and 17 seconds for each customer to pay, the secret aerosol chemical they spray on your head that smells like brand-new tires and the 46-second midhaircut soliloquy your barber will perform about why Black Thought is the GOAT or why Rihanna is finer than Beyoncé. Also, when it’s your turn, no one will say anything, and someone will definitely try to cut in front of you. If you aren’t paying attention, the person after you will be in the chair and halfway through their low Caesar before you even realized you missed your spot. This is no one’s fault but your own. Even if you have chosen a barbershop, it is important to choose a barber based on your individual needs. You must factor in the difficulty of your style, how much time you have, the skill of the barber and, most important, the barber’s breath. Also most important, you must know that once you choose a barber, he is your barber for life. You can never go to another barber within a 20-mile radius. Some people choose to have a barber on the side, but I consider that cheating. A few years ago, a barber really messed up a simple beard-trimming. I decided never to use his services again. The old head: Often the owner of the barbershop, this guy is adept at Afros, older fades and shape-ups, but if you need a newer style, he might not be the one to choose. He believes that Elgin Baylor was the greatest basketball player of all time, and he is going to ask you if you’re single. Always say no, unless you want to go out with his nephew, who’s a “big-time lawyer.” Even if you do, still say no. Important: While the old head might seem like the speedy option if you are in a hurry, you must add three minutes to your time calculations for each of his haircuts. It’s not that he’s slow; he just has to pee a lot. The master barber: Had it not been for education inequality and systematic oppression, this guy would have been a heart surgeon. The master barber is one of the most skilled technicians in the world. His shape-ups connect at exact 90-degree right angles. He is a Picasso with a No. 1 blade. However, if your haircut isn’t uniquely difficult, you may want to choose another barber because 83 percent of the people in the shop are waiting for him. And he’s gotta take a break between each haircut to smoke a Black & Mild. How else will people know? The new guy: He just got his barber’s license, although he has been cutting hair in dorm rooms, barracks and kitchens for years. He is enthusiastic but a little annoying because he desperately wants to build up his clientele. He cuts the hair of a lot of kids, who are dropped off by their parents. He is going to add you to his email list and ask that you follow him on Instagram. He probably wants to Snapchat your finished haircut, too. Sometimes you might arrive and his chair is empty. Never go to the barber with the empty chair! The other dude: He is reliable, pretty skilled and—no matter what time you go—he is always there on time. He makes the most money in the shop because the master barber comes in whenever he wants and the new guy has to pick up his son from day care at 3:15. The other dude has a pleasant attitude and never says much, is fast and won’t mess up your hair. He is the Toyota Corolla of barbers. Just like I still have no idea what exactly constitutes a “press and curl” or what a “split end” is, you’re going to have to learn an entirely new language. If you wondered what I meant earlier when I referred to a “low Caesar,” you should look it up. I don’t actually know where you can find a barbershop glossary, but I’m sure there must be one somewhere. You need to know the difference between an “edge-up” and a “shape-up” and how to describe what you want your finished product to look like. It’s akin to ordering off a secret menu at your favorite restaurant. For instance, a “bald fade, no part, just tighten the top, no razor, V in the back, trim the beard but leave it fat” is a complete order. One of the things you will have to learn about barbershops is that the conversation is intense, often hilarious, often loud and always wrong. Even though this sounds bad, barbershop discussions are the most entertaining things ever created. If you want to know why the CIA put crack in black neighborhoods to trade cocaine for guns, go to a black barbershop. If you want to hear how Allen Iverson should’ve been in the NFL, go to a black barbershop. If you want to hear how reality-show Judge Joe Brown proved James Earl Ray didn’t kill Martin Luther King Jr. ... it’s all crazy. Also ... all those things are true. I read them on my cousin’s Facebook page. Everybody knows it, though. Shopping: It is the black Walmart. A black barbershop is the only place you can still find DVDs, mixtapes, clothing, medicine, beauty supplies and even food. Employment office: If you are unfortunate enough to lose your job, go get a haircut. By the time you leave, you’ll find out who’s hiring, how much they pay, if and when they drug-test and who you should talk to in their human resource department. (Spoiler alert: Her name is Sheila. It’s always Sheila.) If none of this works, you can always make a few dollars sweeping up hair. Social media: I believe that black barbers should file a class action lawsuit against Twitter and Facebook for stealing their ideas. Before Mark Zuckerberg was a glimmer in his father’s eye, barbershops had thumbtacks so you could “post” your “event pages” on the “wall.” Many walls even featured “profile pictures” of the haircuts they offered, and when you entered the door, you had to give everyone a “status update” in less than 140 characters. And there was always a customer waiting who had a bad kid running around the shop. That kid’s name? Tweet. Coincidence? I think not. Yellow pages: This is how you support black-owned businesses. Looking for a mechanic? A carpenter? A better quality of marijuana? A party? A good used car? Again, go get a haircut. I bought my house from a barbershop. Sure, taking my mortgage payment down to Kutz 4 Kingz is sometimes a hassle, but it was well worth it. Entertainment center: If you frequent a barbershop, you can get a copy of a movie before it’s released in theaters. Long before. I saw Girls Trip back in 1989 when I purchased it on VHS at Cutz & Stylez in Charleston, S.C. I’ve already bought a copy of Beyoncé’s next album, and she hasn’t even recorded it yet! So, there you have it. Take this knowledge and go get yourself a fresh cut. Make sure you tip well and don’t let Tweet get on your nerves. She’s a good kid. I’m meeting Sheila for a job interview.